Satchels have long been a favorite with the fashion crowd. Style hunters know the importance of a satchel handbag. There are many satchel styles on the market and some are roomier and hold more than others. Larger styles are perfect for carrying all of your work essentials including a laptop. Many satchels also make great travel bags. Whether it’s utilized as a carry-on or even a mini weekender, it’s a great handbag for the jet set. Travelers don’t always need huge suitcases, especially for shorter trips. If you like to use satchels for quick jaunts, we recommend one that expands a bit. Aside from work and travel, we love satchels as day to evening bags. A smaller sized satchel is the perfect silhouette and style for day activities such as shopping, visiting galleries, and even carrying it to work when you don’t need a larger sized bag. In a way, satchels are almost the quintessential handbag. It’s not a shape you will have to worry about going out of style because it’s a classic. They are the sort of handbags one keeps in constant rotation. Satchels are often passed down through several generations. PLIA Designs very own Reid courier satchels have a fan base around the globe. We set out to create a satchel for the modern style maven. She has her own innate style, she’s busy and always on the go, she loves her iPad and often has to take her laptop to work. The handbag had to accommodate her fast paced lifestyle while also being both chic and functional. Our Reid handbag silhouette is inspired by a courier satchel carried by one of our designers ancestors. It’s both utilitarian and streamlined in style. While there are no overly fussy additions, all of the hardware has a purpose. 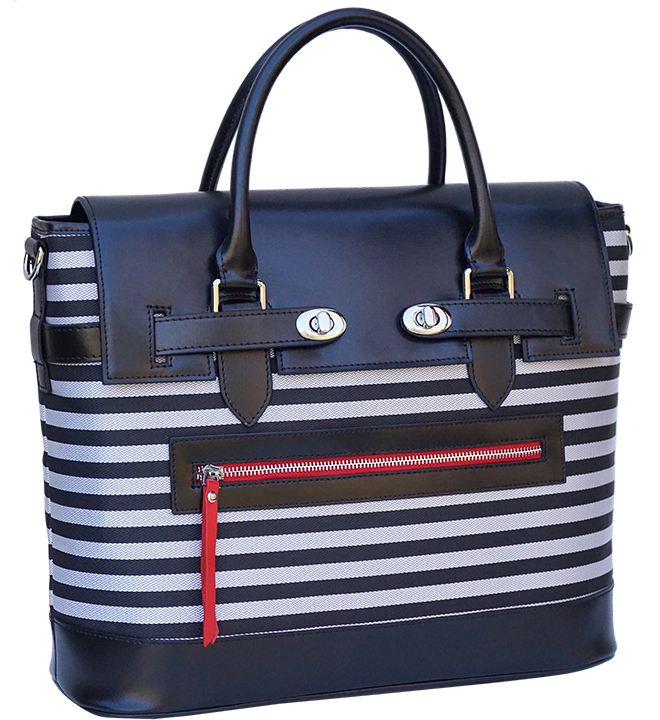 The front twist locks keep the flap closed and zippered pockets grace the front and the bag of the bag. We chose exterior pockets on both sides so you may easily store essentials such as boarding passes, passports, tickets, etc. without having to open the entire bag. Quick and easy pockets are essential when designing handbags. The interior or our Reid satchels are just as well made as the exterior and truthfully that’s how it should be with all handbags. It doesn’t make sense to have a beautiful exterior, but skimp with the interior. Our designers set out to source an amazing interior fabric. It needed to be high performance that would withstand a lot of rugged wear and tear. It also needed to have a strong weave that would support a laptop and other electronic products such as a camera and extra lenses. After the designers couldn’t find exactly what they wanted so we proceeded to make our own custom fabric. Once the fabric was finished, we had it quilted. The reason we wanted to take a plain fabric and then have it quilted with a diamond pattern is that it provides more structure to the interior and it also protects our beloved tech items in a much better way than normal non quilted fabric. We stayed away from dark, thin, loose interiors and upped the luxury factory in a major way. But it didn’t stop with customized fabric, we also added several pockets. Almost everyone we know is attached to their iPad so we added a tablet pocket. Attached to the tablet pocket is a leather credit card holder. You can safely store your ID and two credit cards without the worry of a heavy wallet. Rounding out the interior storage are 3 separate smartphone pockets. These are great for not only your smartphone, but also water and baby bottles. It’s a fashion forward interior we took great pride in designing and crafting. It takes our leather craftsman just as long to make the interior as it does the exterior. And of course our customers love that it’s a roomy interior that fits their laptops. No more is there a need to carry a laptop separately from your handbag. Since our first satchels debuted in 2013, we went on to create two different sizes; the small (which is more of a medium size) and the brand new Pixie. This month we are are very excited to add new colorways to our original Reid satchel handbag collection. For 2015 we have a stellar lineup. It’s the same large Reid satchel, but in new leathers and fabrics. The waitlisted Queen Street is back in stock in a new smoky leather navy body. We went with a navy one shade darker than the original and it’s absolutely smashing. Not only is navy an eternal favorite, nearly a neutral, but it goes with nearly anything. Many bloggers and style stars love to travel with their Queen Street as it’s a very versatile satchel. They comment how many items they can store inside without the handbag feeling heavy. Within the new Reid satchel collection there are several to note. Montrose Street is an incredibly sharp fabrication. Our design studio fell in love the grey and black stripes. The fabric is an extreme strength nylon with a tight weave. This fabric is a great marriage of durability and style. To make the bag pop, PLIA’s designers chose a medium red zipper fabric and leather pull. Montrose is the perfect accessory to a crisp white blouse and your favorite jeans or even a skirt. It’s sunny disposition makes it nearly seasonless. Muir Street is a handsome speckled leather. It’s both tough and elegant and no doubt will be a fast favorite. All original Reid satchels are named after streets in and around Glasgow and Renfrewshire Scotland. 2015 is off to an amazing start with our new Reid satchels. We take deep pride in our design process and craftsmanship. The Reid satchels join a group of designer handbags within our handcrafted collections. They are handbags with layers of design and history that are both old-world and modern at the same time. These charming satchels are sure to elevate your style.